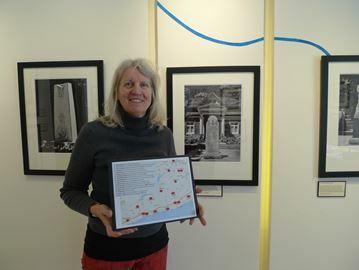 Dorothy Caldwell, local fibre artist, a member of the board of directors and creative planning committee of the Arts and Heritage Centre, holds a map showing the cenotaphs of Northumberland County which are part of the upcoming exhibition. Warkworth – A double feature exhibition that is being held at the Arts and Heritage Centre (Ah!) here opens with a reception on Sat. March 4 at 7 p.m. The free exhibition continues until March 26. These two exhibitions herald 2017 for the Centre which is home for everything from art exhibitions to family art workshops. Bee-Cause and Effect is an “exciting exhibition” of deconstructed beehives by artist Fred Gottschalk who will be hosting a talk on Sat. March 25 at 1 p.m.
“I reconfigure deconstructed hives, then add to and play off the different characters of each hive element utilizing the man-made symmetry of the exteriors, metal lids scarred with the history of the beekeeper’s labour, and physical history of the bees themselves within the interiors of the hives,” he said. He is married to Canadian children’s book author and illustrator Jan Thornhill and they live in Havelock. Rebecca Baptista, arts administrator, left, and local textile artist Sheree Rasmussen, of the creative planning committee and partner of Ah! 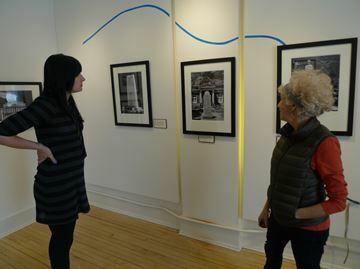 founder, the late Clive Russell, put the finishing touches on “The Cenotaph Project” one of two exhibitions which open March 4 at the Arts and Heritage Centre, Warkworth. The second exhibition is called “The Cenotaph Project” and features photographs of Northumberland Cenotaphs and stories mapped out in the County. “This exhibition marks the community coming together to honour the memory of our soldiers,” commented Rebecca Baptista, arts administrator.